We went out last night at 8pm to make a quick stop at the gas station, then on up Hwy H for some photos of storm clouds over Whitewater. The show was absolutely breath-taking, complete with a funnel cloud. We had turned off at Green Lake Road, to get out of the way of a fast-approaching vehicle, but unfortunately, he was going our way as well. We pulled over to let him pass, then stopped at a clearing between some corn rows, to get some shots of the lightning show. It was all pretty impressive, and while we ooooo’ed and ahhhhh’ed, we also were aware that someone out there was in eminent danger. Once we had our shots, we turned to get back in the truck when we noticed the sky behind us rapidly turning black. We jumped in the blazer and took off in an attempt to get ahead of the storm and home. I called DD19 on the cell phone and instructed her to get in the closet under the stairs, immediately. In a panic, we realized too late, the storm was heading straight for us, and in our haste, we got turned around in the Lauderdale Lakes area. We quickly found ourselves back out on Green Lake Rd. and heading straight into the storm. It wasn’t long before we could not see in front of us, so had to come to a complete stop in the middle of the road between two corn fields, and ride out the storm. The rain came down so hard, we felt as if the wind shield would crack from the pelting. Then the truck began to rock to and fro from the gale-force winds that buffeted us mercilessly. We were helpless to do anything but sit tight and hope we did not become airborne. After about 3 minutes, the rain seemed to let up a little, so we inched forward in an attempt to get out of harm’s way. Within seconds, we were pelted again as a second surge came at us full force. Again, we were forced to stop in the middle of the road, and hang on for dear life as the truck again began rocking. 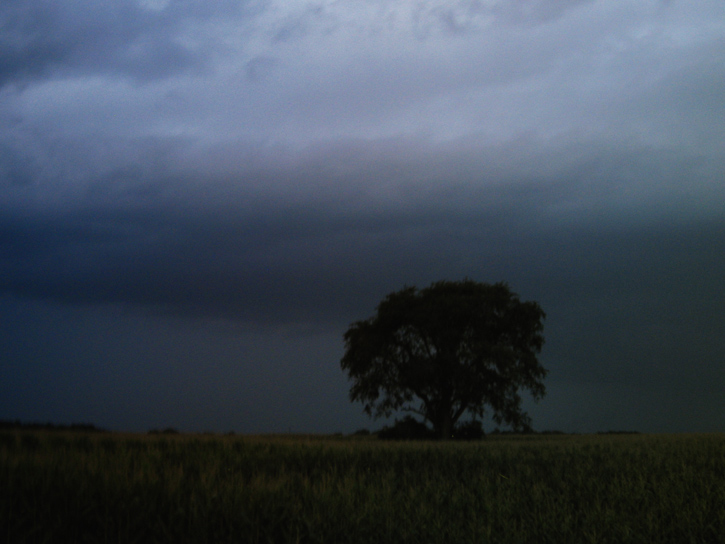 As I looked out the passenger window, we saw a lone tree bent over nearly double by the winds. After what seemed like an eternity, we once again began our trek back toward the highway and eventually HOME. DD19 was still under the stairs, nearly in a panic as a tree branch slammed into the front door above her. Once we got out on Hwy H, we could see the extent of the storm’s wrath, as we passed by and over the debris field left behind in the storm’s wake. As we turned on Lost Nation Road, we came upon a vehicle that clearly had been blown off the road sideways by the force of the winds, into some trees that grew in an embankment near a ravine or “kettle” as we call them. We pulled over as a rescue vehicle and two other cars came up behind us and then stopped in front of us. DH got out to see if he could help locate a driver of the vehicle, but no one was found. The gas station was totally dark as we passed by, and we wondered how many were affected. We learned today, 2034 customers were without power for over 14 hours. When we got home, the driveway was a total disaster, branches everywhere. DH had to get out and clear the way just so we could get to the house. We wouldn’t be able to assess the damage until the next morning, at first light, but it was clear something had passed over us. The next morning, we learned from the neighbors, a funnel had indeed been spotted over Whitewater and another coming toward our area at about the same time we spotted what we believed was a tornado forming. The next door neighbors had damage to 6 of their trees; one was snapped off about 16′ up, and the rest lay in the path between our two houses. Branches were tangled in the surrounding area, and one branch came to rest on top of DD19’s car hood, but did no damage. Luck was on her side, this time. We took a ride out the DH’s folks house, to make sure there was no damage there. They were out of town and were concerned that there might be storm damage. Everything looked undisturbed, except for a scarecrow that fell over and got soaked by the rains. Other than that, everything was fine. The rest of today was spent cleaning up the mess, in 80+ degree weather, humidity and sun. We worked until we couldn’t lift another branch, twig, or leaf, and gave up for the day. We were surprised by how much we had accomplished; most of the debris in the front yard was gone, and all that was left were some larger limbs which we set off to the side for tomorrow. I think I’ll just fix a bowl of garlic pasta and call it a day. Will post pictures as I get them- the cell phone went dead early this morning, and most of the first pics were taken at first light.